Dermoline Aloe Vera Gel for horses is a moisturising gel to improve skin condition. Suitable for minor irritations and damaged skin. Dermoline Cooling Body-Wash for horses is a concentrated soapless body wash with tea tree oil. Dermoline Herbal Shampoo for horses contains natural herbal extracts in a rich shampoo to provide a thorough yet gentle cleansing of the coat. Dermoline Insecticidal Shampoo for horses is used for routine coat care, treatment of lice infestation and show preparation. Dermoline Mane & Tail Conditioner for horses is a luxurious hair conditioning lotion. Dermoline Mane & Tail Conditioner Spray for horses optimises coat condition to ensure easier, quicker and long lasting grooming. Use regularly to ensure tangle free manes and tails and a sillky long lasting shine. Dermoline Medicated Shampoo for horses conditions and cleans with a gentle anti-bacterial action. Dermoline Soothing Throat Syrup for horses is a concentrated syrup to instantly sooth the respiratory system. Deep penetrating multi action formula for dust irritations. 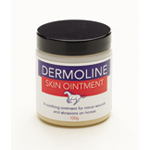 Dermoline Soothing Wound Cream for horses forms a protective barrier over minor injuries to help keep the wound free of mud and water. Dermoline Stable Louse Powder is a multi-action formula that acts as a rapid and long lasting repellent against lice and other external parasites on horses. Dermoline Sweet Itch Lotion for horses is an oily lotion for application to the mane and tail as an aid in the prevention of sweet itch.